Samsung Galaxy S9 review | What Hi-Fi? Samsung’s R&D department must have breathed a sigh of relief when it got through last year without a hiccup. After a rocky 2016, the S8 and S8+ were the successes Samsung needed, and the triumphant return of the Note series was the icing on the cake. But after adopting a trailblazing change with the S8 family, how could Samsung continue to grab headlines (of the good kind) in 2018? The answer is by not changing very much at all. For the S9, Samsung has instead taken the rather Apple-like approach of overhauling little and tweaking everything. This means if you’ve got an S8 at home, you might not feel inclined to rush out and trade it in. But if you’re upgrading or switching brands, Samsung’s careful refinements make the S9 a pretty impressive package. After introducing its longer, slimmer 18.5:9 screen ratio in the S8 family, Samsung has stuck with it in the S9. Not surprising, considering most of the smartphone industry has since followed suit. This means the S9 looks much like its predecessor, covered front and back in hardy Gorilla Glass 5, with the front screen curving around at its edges to meet a reinforced aluminium frame. It’s as well built as ever and feels fantastic to hold. 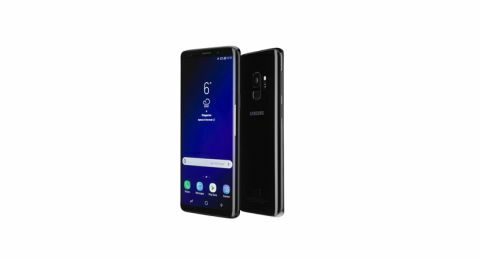 As with the S8, these curved sides mean the S9 appears almost bezel-less to the left and right, but Samsung has even pushed back the bezels along the top and bottom by embedding the infrared sensors into the S9’s display. That means more screen, with no buttons to blemish the front display. There’s just a volume rocker, power button and Bixby key on its sides, and the fingerprint scanner on the back. This has been refined and repositioned compared with last year’s rather awkward placement, and it now feels easier to reach when holding the phone, so you won’t need to shift your grip to access it as you did before. It’s still a little close to the camera, meaning that grubby fingers can cause a smeary mess of your beautifully reflective phone, but that’s almost unavoidable with any glass-backed phone. The S9 will be available in midnight black, coral blue and the (rather striking) signature colour, lilac purple. With the S9 sticking with the 18.5:9 screen ratio, you get a lot more screen than you would expect. It is considerably slimmer than the iPhone 8 Plus, for example, but squeezes in a larger 5.8in screen. It uses the same Quad HD (2960 x 1440) display as last year, and also continues with its HDR Mobile Premium certification, meaning you can watch compatible content on Netflix and Amazon. We watch the first episode of Stranger Things on Netflix, and when the boys go looking for Will in the woods, the torches on their bikes shine with more punch and detail than you might see on a phone without HDR. Thankfully SDR footage looks great too. The AMOLED display ensures contrast is superb, with deep blacks sitting comfortably next to searing whites for a truly impressive dark-scene performance. Colours look a little improved this year. Whereas previously we’ve struggled to find a colour balance we can really get behind on Galaxy phones, this year it seems better. We opt for AMOLED Cinema for the most accurate results, which seems to have been tweaked so whites look a little purer than before. We also toggle the video enhancer mode on and off and largely enjoy the results with it on – it puts some extra welly behind highlights and colours without overdoing it or upping the overall screen brightness. As for detail and sharpness, you’re unlikely to find much better. There’s still something a little more natural about how the iPhone handles things, but it’s arguably not as striking or engaging as the performance on the S9. A truly excellent screen. Amidst all the tinkering that’s gone on under the hood of the S9, the camera has probably seen the biggest changes. While the S9+ gets an iPhone-esque upgrade to a dual-camera system, the standard S9 sticks with just the one. On paper, it has the same the same 8MP f/1.7 selfie camera on the front and the same 12MP sensor on the back, complete with dual-pixel autofocus and optical image stabilisation on the latter. But the S9 also has a new feature: a dual-aperture lens. Instead of using one fixed aperture, which most manufacturers have been pushing lower to improve low-light performance, the S9 can switch between two. One is for those low-light situations, dipping down to a market-leading f/1.5 for a phone (letting in 28 per cent more light than the S8), while the other – at f/2.4 – is for lighter scenarios, anything of around 100 lux and above. While a wide aperture is great for lighting up dingy environments, in brighter ones it can affect colour saturation. So to keep well-lit snaps looking punchy, the S9 skips between the two, without you needing to change it manually. Dual aperture is also joined by multi-frame noise reduction, which helps keep pictures looking clear and sharp in low light, promising 30 per cent fewer artefacts than before. Of course, proof is in the snapping, and the S9 holds up well in both good light and low light situations. In the daytime, pictures are sharp, bright and detailed, with auto HDR on hand to take care of any shots in danger of over- or underexposure. Colours look natural and believable, but could occasionally do with a little bit more punch. In low light, the S9’s low aperture certainly works its magic, brightening up moody scenes and capturing more detail than we’d expect, with very little noise. As for video, the S9 is capable of recording in 4K at 60fps, but also comes with a new super slow-mo video mode - a feature we first saw on last year’s Sony Xperia XZ1. Offering a very slow 960fps at 720p (regular slow mo is 240fps), it can turn a 0.2-second clip into one that’s six seconds long. To keep things moving smoothly, Samsung has fuelled the S9 with its brand new Exynos 9810 octa-core processor, supported by 4GB RAM and a singular 64GB (plus microSD) storage option in the UK. The resulting performance is as slick as ever, with no stutters or hiccups, even when under extreme multi-tasking duress. Benchmark testers have already declared this as one of the most powerful phones of the year, and you’ll struggle to throw anything at it that will fluster it. Unfortunately, the Galaxy S9 has been paired with a slightly underwhelming 3000mAh battery capacity, the same size as last year’s S8. Considering its software tweaks, we’d been hopeful we might see improvements here but, actually, we’d say the S9 is actually a little worse off. Under relatively heavy use, we find ourselves reaching for the charger in the early portion of the evening. At least the included charger is a fast one, so can get you back up and running quickly, plus there’s wireless charging built in too – compatible with both the Qi and PMA standards. Elsewhere there are a number of welcome returns to the spec list, including waterproofing to an IP68 rating (up to 1.5m for up to 30 minutes), plus an improved Bixby Smart Assistant, which now has a number of new capabilities, including the ability to translate text in real time via the camera. Both Bixby Voice and Bixby Vision are more accurate in use, but there’s still work to be done for it to catch up with the superior Google Assistant, which is also on board. For that reason, the dedicated Bixby launch button, located underneath the volume rocker, seems like overkill. It’s a shame this can’t be patched to access a more useful feature of your choosing. One of the new features of note is the AR Emoji functionality, in which the S9’s camera scans over 100 reference points on your face to build an emoji character for a more personalised experience. Sure, it’s a gimmick, but if you thought Apple’s Animoji was cool you might find yourself delving into this feature too. Samsung continues to support high-resolution audio up to 24bit/192kHz, as well as DSD files, and has gone against the grain by keeping the 3.5mm headphone jack. That means you can plug in your favourite pair of headphones without the need for an adapter. There’s also a pair of AKG-branded in-ears in the box, but they sit a little on the rich side for our tastes, with slightly boosted bass. Opt for something more neutral and you’ll get to hear what the S9 is really capable of – a clean, clear and detailed sound, with plenty of drive and a decent amount of nuance and expression. It’s an upfront, full-bodied performance – the S9 is not the shy and retiring type – and is at home with most genres of music. However, it doesn’t have the precision or timing to handle more complicated arrangements, such as classical music or jazz, and can’t string together a piece of music as fluidly as something like the iPhone 8 Plus or iPhone X. The Galaxy S9 packs stereo speakers for the first time, which sound much louder than the single mono speaker of previous iterations. They aren’t hugely detailed though, can sound harsh towards top volume and don’t muster up much in the way of weight. They’ll do a good job of projecting voices clearly for the odd YouTube clip, but you won’t want to do any sort of critical listening with them. Dolby Atmos sound is included for the first time too, which you can toggle on and off as you see fit. The result is a noticeably wider, but ultimately less solid sound, which we’d be wary of for the most part. We’d certainly suggest you keep it off for music – watching video with it will be a matter of taste. We prefer to keep it off. Without flexing too many major muscles, Samsung has rustled up a pretty polished successor to the Galaxy S8, with a handful of carefully considered tweaks, all built into one of the best designed smartphones you can buy. And when you consider the new camera tech, faster processor, better speakers, and overall improved experience – from Bixby to biometrics – there’s actually more changed than might originally meet the eye. In terms of sound and vision, we’d still say the iPhone X takes it for overall performance, but the S9 is still a king of video. We’d just like that last word in timing and organisation when it comes to audio. A slightly stronger battery wouldn’t go amiss either. If you’re coming from the S8, you might not be quite so compelled to make the upgrade, but if you own the S7 or are making the move from elsewhere, the Galaxy S9 makes a strong argument to be one of the best Android phones this year.